How easy is it for your customers to learn about your business, make a purchase, understand the benefits, or contact you regarding your product or service? 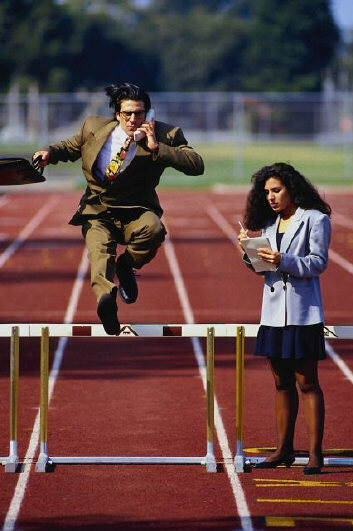 How many hurdles do potential customers have to overcome to complete a purchase? Barriers imposed on customers and potential customers are not only costly but result in a significant loss in revenue. Many businesses are continuing to look for ways to increase revenue and decrease expenses. This objective can be met by simply eliminating communication barriers with customers and prospective customers. Place excellent service as your priority, not the lowest price: It’s not always the lowest price customers are looking for, but more often great service i.e. “less barriers”. Trends show customers are more focused on the service provided by business than on the price. It makes no sense to offer the lowest price and provide poor or unreliable service. Service, in the customer’s mind, begins when they are first introduced to the product or service. Customers are less likely to complete a purchase or are at high risk for not repeating their purchase when the process is unpleasant. Offer simple and easy to understand marketing materials: With so much information, there’s little time to spend on reading through materials. You have only a short time to get your message across giving the decision maker a reason to invest even more time learning more about your product/service. Providing well organized information and demonstrating clearly what you offer is important to complete the first round of “getting to know” your business. Project a professional image: Now-a-days it takes more than business cards and a web site to project a professional image. Social media; images and other visuals; and first impressions have an impact on how the business is perceived. Professional image is a way to gain trust and interest. Businesses that don’t appear to be professional put themselves at a great disadvantage. You may not be aware of the business lost because people are turned off from the beginning and go else where. Sell only to customers who are best served by the product/service: You are not doing anyone a favor by providing a service or product to a customer that doesn’t fit your target market. Too many times companies provide service as a “favor” or to simply close a sale only to discover they’ve created a financial or time management disaster. The end result typically is a dislike between the customer and the company. Before taking on projects “outside the box”, make sure provisions are in place to keep the project on track so the satisfaction of the customer is met and your reputation is upheld. Educate prospective customers on the product/service: People have in mind what they need. Businesses create services and products to meet specific needs. Clearly stating what your company offers or perhaps doesn’t offer, is helpful during the decision process. Consultative selling is an approach most appreciated because businesses invest in the overall education of the decision maker. Even if a sale is not made, what is created is an awareness of your product/service and perhaps a future opportunity. Make sure decision makers can easily find you: The easier it is to get in touch with you, the easier you make it for a potential customer to decide whether or not to buy from you. If you’re hard to find on the web or if you’re hard to reach by phone or email, then it could be concluded you may not measure up to expectations. This includes your availability on other social media outlets and networking circles like Facebook, LinkedIn or Twitter. Create an advocate, not just a sale: Businesses focused on creating advocates have an easier time staying true to their target market. The goal of having people telling others about your business engages everyone, not just your target market. Word-of-Mouth marketing is the best way to grow any business. So next time, instead of walking away when you realize what you offer and what they need doesn’t match, spend a little time finding the right solution for them – refer them to another company. Keep active and inactive customers informed of services offered: Many businesses offer more than one product or service or offer different ways of using the same product or service. There is a mutual benefit for your customers to have a clear understanding of all the products and services offered. While they may not have an immediate need, when the need does arise or if they know someone seeking similar products/services, they will turn to you or refer your business instead of seeking out another business. Involve your customer and your staff in creating a positive customer experience: The best way to learn is to ask. Customers and staff are the best resource for insight. Many times decision makers (especially small business owners) depend on their gut, not customer feedback. The process does not have to be lengthy or complicated. Create a few simple questions and the answers will provide you with the information needed to make changes. Ask customers questions like: Are we meeting your expectations?, Is there anything we can do to improve our service for you?, and certainly, Would you recommend our business to other businesses? Ask staff questions like: Do you believe you are meeting the customer’s expectations?, What more can we do to improve service for the customer?, Would you recommend our business to other potential staff members? Address customer issues pro-actively: It’s better to ask customers about their experience vs. relying only on incoming calls to complain about an issue. An established internal process will make it easier to correct problems before they become more widespread. Additional costs are recovered for correcting problems sooner instead of later and through improved communications with customers. The bottom line is to engage staff and customers. The value of feedback is substantial if created to improve the customer experience, not just added as another annoyance. Technology has given businesses the opportunity to check in with customers throughout their life cycle, although even with technology the human touch is the most important. Involving all organizational representatives and providing customer satisfaction incentives are resourceful tools in reducing barriers for customers. Eliminating a negative experience will gain more customer loyalty, increase retention and generate revenue.